very beautiful piece. Got it for a friend and she loves it. Add sparkle and style to your outfit with this beautiful crystal-accented watch. 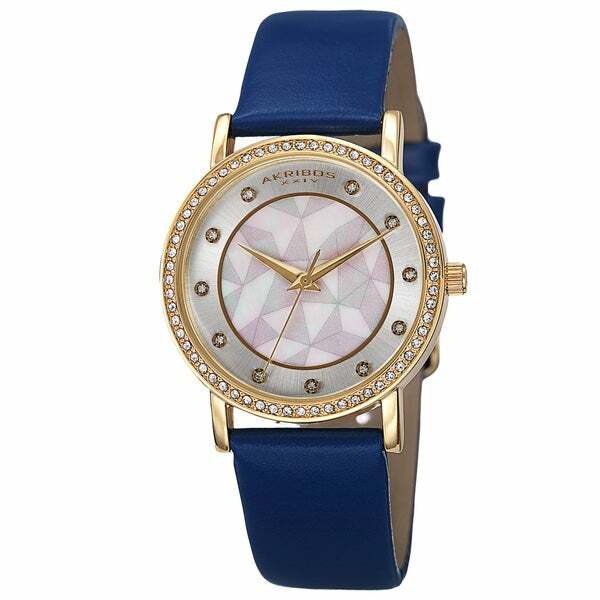 A beautiful blue leather strap makes the gold-tone bezel pop, while crystals accent the bezel and face. The sunray dial face with a mother of pearl center gives this women's watch a timeless style. Classy, accurate, modern with that antique flair. I feel this watch can be worn to the prom, a wedding or forever in blue jeans. Beautiful. This is a beautiful watch. The mother of pearl face is especially gorgeous. The strap is genuine leather so it is durable. I loved the look of it. Even the box it came in was plush. Love this watch. So beautiful. I finally found a bright white watch. So hard to find. The pink pearlized face and crystals are an added bonuses. I love this watch. I have a large wrist and some strap watches just don’t fit. This was more than ample. The size of the face is also just right. A great buy for the money! I want to wear a watch, not have it wear me. This one fits the bill perfectly. Especially like the strap which is sufficiently long to offer me several options as to where to place the watch on my arm/wrist. This watch is exactly as pictured. It's beautiful and comfortable to wear. The face is not to big and not too small perfect for a smaller wrist. I got the blue band and it is same blue as depicted in the picture. This watch retailed for $425 and was marked down to around $*. Sounds good right. Well it's pretty but very light weight and the leather strap is very thin. I'll keep it but if I was looking for an everyday watch this unfortunately would not make the cut. Sturdy and pretty, just as pictured. I like Akribos watches, their slightly larger size and sporty style with a touch of femininity. This watches face is beautiful. My daughter is going to love it! A great watch which was a Christmas gift to my daughter. She liked it - so I was pleased with the purchase. Would not recommend to a friend. Watch was too big for my taste and did not look good on my wrist. That was a poor choice for me....please show more in accurate sizing. Looks great. Fun and flirty. I think it is very pretty watch got it for woman that had child by me but never married. it is not her way to compliment anyone but herself. Cheap quality, on the tacky side. I just waited too long to return it. This watch was a disappointment. The band is really cheap looking and the watch is not much better. "I do not understand the demensions of the face of the watch. Could you make it a little more clearer." I love the color blue, and I liked the watch. Watch is more beautiful in person!!!!!!!!! I have very small wrists and the face of the watch still looks like a woman's watch in "face size." It is quite elegant and I never wear it without receiving many compliments.